Representatives of the U.S. state of Florida attend global airshows to make contacts in the aviation, aerospace and defense industries to help their local companies expand globally. Enterprise Florida (Booth N77), a public-private partnership that oversees the U.S. state’s economic development efforts, attends Singapore and other global air shows to help Florida companies in industries that include aviation, aerospace and defense with global expansion and trade leads. Ken Cooksey, Enterprise Florida’s regional manager for aviation, aerospace and defense, noted his state has been a global leader in aerospace and is home to many small and medium-sized aviation companies. “We have a robust network of private companies, stellar universities and a state government that drives industry,” he explained. Florida has targeted the aerospace, aviation and defense industries because the state wants to be more competitive globally, said Cooksey. “We also want to create high-wage jobs and these industries do that,” he said. Enterprise Florida’s public-private partnership means the state understands and works with the private sector, said Cooksey. “Our board of directors is made up of 70 corporate leaders who help us know what their business needs are. [Florida] Governor Rick Scott is chairman of the board and he interfaces with these leaders who advise us,” he explained. Cooksey said he does all of this on a modest budget of $11.5 million a year, 20 percent of which comes from the private sector. The university now offers one graduate and two undergraduate degrees in Singapore with 150 students, said Cooksey. “This is a good example of organizations using Enterprise Florida as a resource to expand in other areas of the world,” he said. “We had another small company going to the show for several years and put a location in Singapore in 2008. 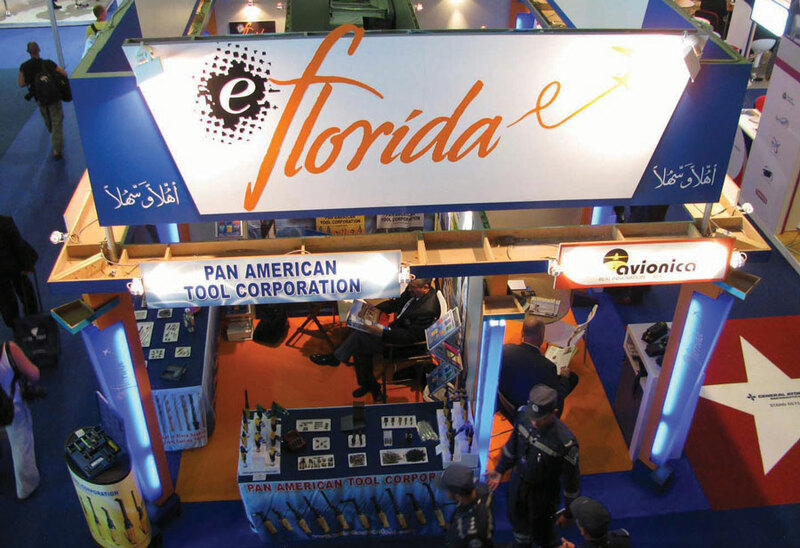 The owner credited Enterprise Florida with helping them and has plans to open a location in China later this year.” Attendees at this year’s show will have access to around 15 companies at the Enterprise Florida stand, he added. Enterprise Florida’s efforts help make the state more competitive for business, said Cooksey. “In the past, we had industries line tourism and agriculture to sustain us, but we had to be more competitive, which is why aviation and aerospace are so important,” he said.